Our natural flax hemp rope offers certain advantages over the manmade alternatives, but if you’re looking for synthetic hemp rope we offer that too, by the coil, reel and metre. As a naturally occurring fibre, hemp has long been the primary material for ships’ rigging and other marine uses, and as hemp ropes float you can see why sailors adopted hemp with enthusiasm. Hemp rope has been used for many years due to its superior strength and resistance to rotting. Another significant benefit to hemp rope is that it is much easier on the hands than alternatives. 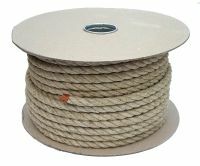 It is also known as one of the most versatile ropes on the market. Hemp rope is suitable for varying practical and decorative as well as remaining functional in and outdoors. We offer a three-strand natural hemp rope woven by our partners in Europe, starting at 6mm and going all the way up to a hefty 36mm. Hemp is widely recognised as one of the strongest natural fibres on the planet, frequently used on many sailing ships travelling from Europe to the new world America. Hemp is the perfect choice where handling is to occur, and its soft finish makes it ideal for barrier ropes, stair banister ropes and gymnasium climbing ropes too. You’ll also find hemp rope used extensively in theatres for the lifting and suspension of scenery. While natural hemp rope may be more expensive than synthetic hemp rope, we keep our prices on hemp extremely affordable, compare us to the competition and we’re sure you’ll agree. The hemp ropes we produce is also environmentally friendly, being 100% organic, 100% Vegan and UV safe. Interested in purchasing some hemp rope or just have a few questions? Don’t hesitate to contact one of our experts via the contact form. If you’ve made your decision, order now for fast shipping, including Next Day Delivery to mainland UK addresses for our commercial customers.